It’s FALL! Many are shouting about their favorite season: “hoodie weather!” “roasted marshmallows!” and “pumpkin lattes!” While I love all those things too, I often want to pull the covers over my head, and hibernate until it’s springtime again. But God is healing me, and He can heal you too! So…we are going to CELEBRATE FALL! Here’s a bright orange metal bucket with rafia wrapped wooden handles! Some things inside are: the book Jesus Calling by Sarah Young, a brown leather Jeremiah 29:11 journal, an orange pumpkin pie candle, luxury lemon & argan oil soap, a warm/cool headache compress (for busy holidays!) 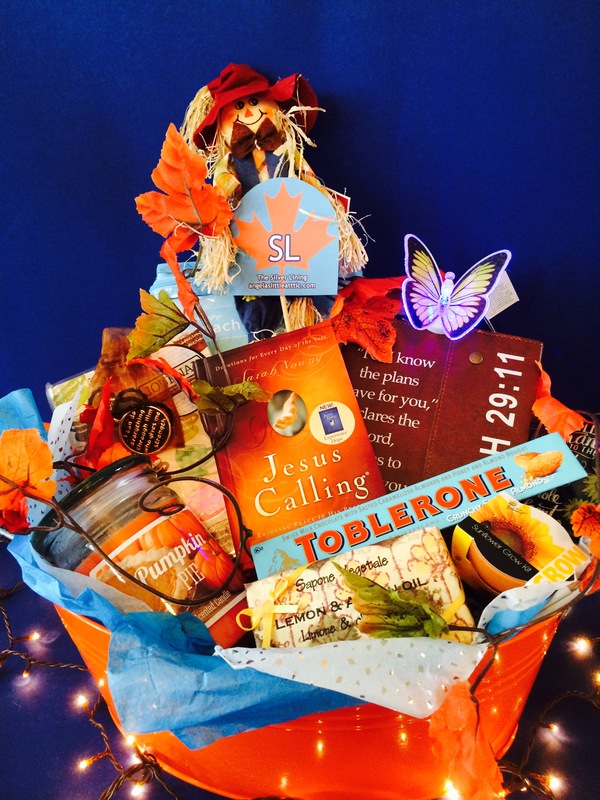 a mini scarecrow, Toblerone chocolate, and more! To enter, comment with a favorite bible verse under this post. You can also find this giveaway post at either The Silver Lining website (under the giveaways tab) or on The Silver Lining Facebook page. Your bible verse comment is your entry! If you’d like, you may enter at both the website, and on Facebook, which will count as two entries. It’s all about encouraging others in Jesus Christ. It’s all about forgiveness and eternal life. It’s about sharing God’s perfect love with others. Thank you for entering, Vicki! Cindy, I’m so glad you picked one of my favorite verses from one of my very favorite chapters of the bible! I love the reminder that nothing can separate us from the love of God when we have Jesus Christ! 1 Peter 5:7. Cast your cares on Him for He cares for you .